@TitoOliveira I haven't played Minish Cap, but that is a pretty cool idea. Definately something original I hadn't though of. Thanks! @Necdilzor Thanks man. And yeah, fog of war doesn't seem to be a popular choice. In combat, it's almost like a lame fight scene where the enemies come at you one at a time since pathfinding can take so long. Since pathfinding is already about as optimized as it can get, I made so NPC's can now share pathing information. 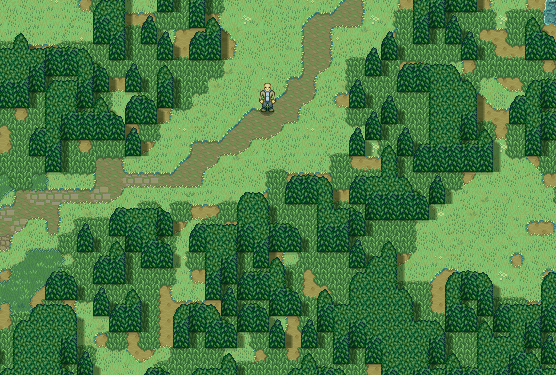 If two (Or more) NPC's are near eachother and are headed to the same destination, they just share the same path. This can change 100 path calculations to 10 or so. Also I made a blood splat. Is this better than a flashing sprite, or too violent? Overall, the AI was really fun to work with. It needed almost a complete rewrite but now it's much faster and also easier to change. I'm hoping to have battles with 100 units, but I'm not sure if that will be possible without pushing the requirements too high. The path sharing looks better also. @sbeast Probably will need music at some point, but that is still a long way off. Still lots to do! Thanks for the inquest though. Ok, that's cool. I'm an experienced composer, and would be interested in collaborating if/when the time comes. So I added spiders and I tried to make them move all creepy like actual spiders. They are unpredictable. They may attack on sight or they may just sit and watch. But they have a swift pounce. Another new enemy is the rat. It's cowardly alone, but will attack in groups. First the rats try to run away but then attack when they realize they have companions to help. They're pretty weak. 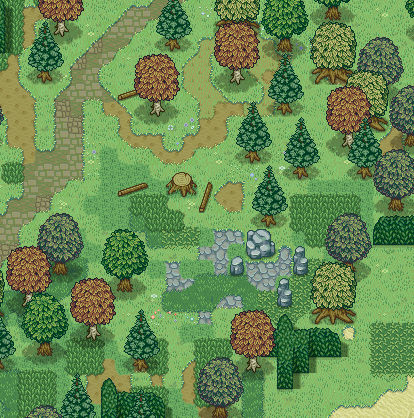 In the art department I have been working on woods and forests. Previously woods have been looking like a weird hedge maze thing. 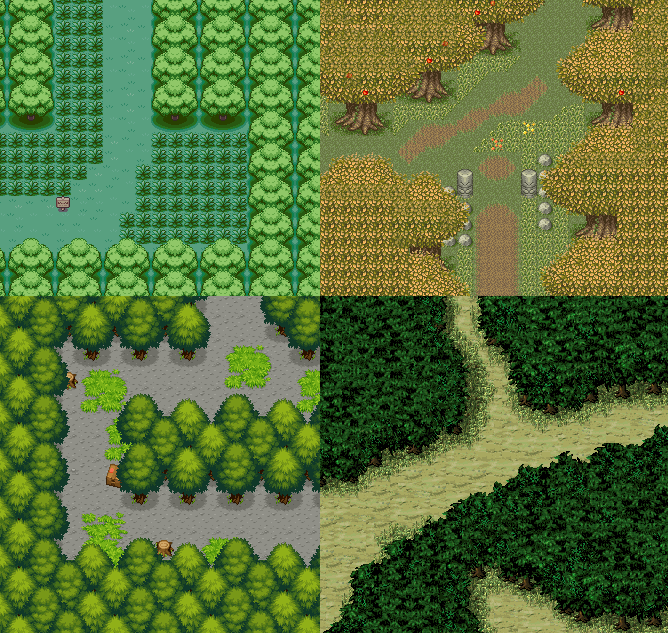 Essentially I was making a bunch of corridors with trees for walls. Since that's what pretty much every SNES game does, I didn't even question it. I just copied what I saw. After a bit of wasted work, I remembered something. I'm making an OPEN WORLD game. 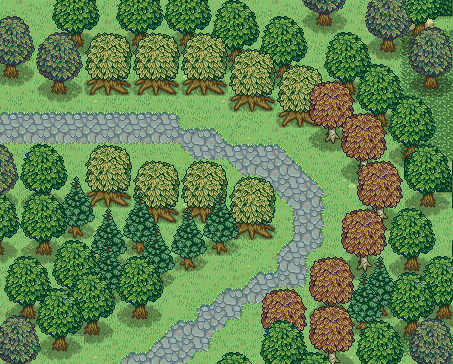 Why am I making the woods corridors? Personally I think the trees could use a little more polish, to make the vegetation look thicker, but I really like those spiders. I'm always a sucker for retro looking things. For some reason the herds of pigs and skeletons and whatnot are just so cute! Beautiful graphics and exciting game idea! I'm just always wishing for weird plants/buildings/locales besides standard green forests and trees in games like this. I don't know if you wanna go for the "standard" medieval-forest themeーI guess you do, and it looks greatーbut your style on some more off-the-wall areas/creatures/plants would be exciting to see! I think the trees are quite good. What you are saying, is maybe some more bush would make an impression of thicker forest, which may me true. The spiders are amazing. The reason I found Bloodborne's one instance of giant spiders so unnerving was how incredibly fast they were from a completely stopped position. It's something I find creepy about real life spiders and it looks like you've translated it well. Please make the game already ;/ The scripting of AI is formidable. And sorry but I steal the idea of swift pounce spiders. My current spiders are lazy bums. Keep it up! I really dig the art style. However, is your character a pacifist or something? I've noticed the gifs show the mobs attacking it, but not you attacking the mobs! I saw you started another project, is this one on hold while you do a smaller project ? Was the scope too big ?